OKI Data to Show White and Color-on-Color Printing Capabilities at PRINT 17 | Industry Analysts, Inc.
CHICAGO – September 7, 2017 – OKI Data Americas has announced that its best-in-class color capabilities spanning the company’s light production, wide-format and textile offerings, including its groundbreaking CMYK + white solution, will be demonstrated in its booth #3218 at PRINT 17, Sept. 10-14, in Chicago. Leading the lineup will be OKI’s proColor C942dn printer, the company’s most revolutionary machine that lays down unparalleled high-density white toner under color in a single pass, allowing for outstanding full–color graphics on dark-colored media in addition to color on white stocks. Offering print shops an opportunity to differentiate themselves from the competition, the small footprint machine uses superior toner at a lower price point and prints on a wide range of media including envelopes, magnetic media, polyester, transparent film and heavier stock, unlocking a host of new possibilities for graphic artists. New for PRINT 17, OKI will have our in-house master designer on the show floor, demonstrating white and color-on-color design techniques, allowing users to experience the full capabilities of the C942dn from on-screen designing, to file set-up, to finished product. These sessions will be offered throughout the show in booth #3218. C9DP+ Envelope Print System: Shown in conjunction with OKI’s C931e CMYK printer at PRINT 17 will be the new C9DP+ envelope feeder. Interchangeable with any of OKI’s C900 series of printers, the feeder converts devices into short-run production systems and offers greater efficiency with fewer interventions. Designed to manage high quantities efficiently, the feeder enables users to offer stunning output and new services at high speeds, helping them stay competitive. With variable data envelope printing enabled by the Fiery C9 color management server and its Command Workstation, users can streamline operations and tailor prints based on demographics and other preferences—a large and untapped market. ColorPainter E-64s:Launched at the end of 2016, the E-64s shatters expectations for quality, speed, efficiency and longevity among wide-format printers in its class. It is designed to deliver incredible value to professionals at all levels who value producing high-quality output in both outdoor and indoor applications. 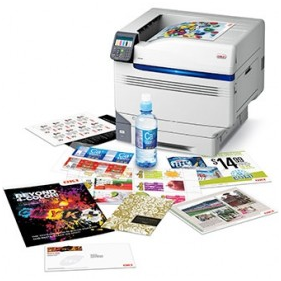 The E-64s is engineered with innovative technology; industrial-grade print heads; efficient, low-odor, eco-solvent ink that produces vibrant, glossy graphics with exceptional color saturation and durability; and other innovative features that streamline operations and deliver excellent return on investment. ColorPainter M-64s:Engineered for the rigors of mid-to-high-volume print environments where maximum speed and superior image quality are everyday essentials, the M-64s offers an industrial-grade print solution that delivers maximum durability for a variety of indoor and outdoor graphics. Pro8432 WT:This new tabloid-sized textile printer with industry-leading, solid opacity white toner technology and CMY color enables users to print on dark garments. The Pro8432WT provides HD-quality color heat transfers for apparel, hard goods and a wide range of other materials. Compact and highly efficient, it enables simple operations and lower costs. Pro6410 NeonColor:By enabling the printing of bright, fluorescent colors on transfer media, producing dazzling effects on both dark and light backgrounds, OKI’s fluorescent printer frees creative businesses from the limits of the standard color spectrum. The transfer media enables users to personalize almost anything, delivering groundbreaking technology with fast return-on-investment. The company is also gearing up for a new channel partner program for C900 series printers that will launch later this fall. This entry was posted in OKI and tagged OKI Data, Print 17 by IA Staff. Bookmark the permalink.